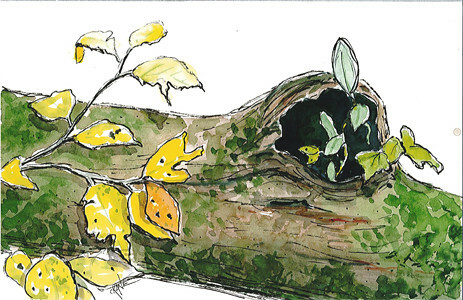 What Grows in Felled Log – watercolor – Let's Paint Nature! This watercolor was done from a friend’s photo of a felled log in the woods. 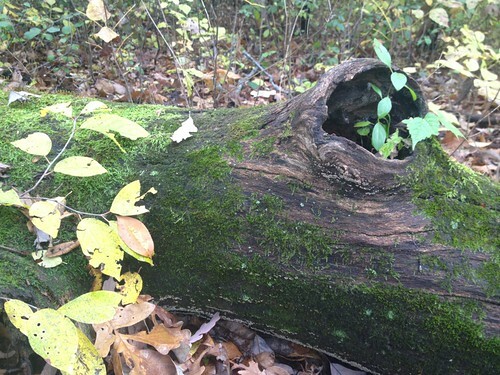 I love how little seedlings took in the cavity of the log, making a very suitable home. The wet forest floor makes perfect conditions for the yummy moss that encapsulates the log. How I wish to be tiny and make my home in one of these! Almost magical. I’m sure many insects also take advantage of this cavity and the woodpeckers seek their prize by enjoying a tasty snack! How wonderful it is deep in the forest! My watercolor may not look exactly like the photo…but that’s okay! I decided to make the autumn leaves grow way beyond just the top of the log like the photo. I think it looks better that way. The only thing I would do different would be to add salt to my watercolor before it dries in the area of the moss…that would have been a nice added texture! Next time! I hope you are getting out there and enjoying this wonderfully blessed season! I believe it is more than ok not to look exactly like the photo. What you have captured with your watercolour is the feeling/emotion of being deep in the forest and that is an amazing skill. Love the idea of using salt to add the texture of the moss … that is very hard to capture and the salt sounds like a great idea. Pretty painting! I love the lightness of your hand in painting! What a great watercolor! – Just the style I am trying to develop – it’s so loose and natural. You inspire me to want to paint more. Thanks Christine! A blessed season indeed! Nothing like walking in the woods in the fall, and that post-foliage time has its own special charm. Beautiful sketch, Christine. You’ve made the scene warmer and more inviting than the photo– take a bow! A very Happy Thanksgiving to you! !